As usual this year I’m going to keep my private resolutions private but publish my “what if” resolutions for the city of Rome. I’ll confess this is a reworking of a post from last year (my apologies for long-time readers). The issues facing Rome don’t change too much from year to year, for better or for worse. Ban all cars and petroleum-fueled vehicles from the historical center except for ambulances, hybrid taxis and delivery trucks (during specific times only). Learn from Venice, restricting access to certain streets entirely as is done already in some of the Ghetto streets like Via Reginella while streets like Corso Vittorio and Via Arenula remain thoroughfares for buses and taxes which drop their passengers at important nodes where they proceed on foot into the narrow pedestrian streets. Result: more uninhibited pedestrian activity throughout the historical center will enhance the local economy, encourage tourists to stay longer and spend more, reduce health and safety risks, free up space now occupied by cars for other productive activities. Residents who insist on owning cars (a “privilege” residents of cities from New York to Amsterdam do without quite happily) pay to keep them stored in structures at the edge of the center, convenient to exits to the city so that cars can be used for excursions to the country, the only remaining role suitable for private automobiles. These car-storage structures, akin to Venice’s appropriately named Piazzale Roma, might be planned in underutilized sites such as the air-space over (or ground under) train tracks, former military barracks, and government buildings deemed expendable by optimization projects. Raise the cost of parking throughout Rome to reflect the true environmental costs of autos and the true value of real estate. If sub-standard housing in central Rome rents for € 50/square meter/month then a 10 m2 parking spot should go for no less than €500/month or €2/hour. But add in the cost of infrastructure that allows for cars to function, road construction and maintenance, the health and safety costs from pollution and accidents and the military costs of ensuring access to fuel, not to mention the cost of dismantling and disposing of vehicles at the end of their cycle, parking should jump to prohibitive rates. Result: the relative advantage of private automobile use disappears and more money becomes available to improve transit, biking and pedestrian facilities. Implement strict guaranteed schedules for all public transit in the city. This has long been possible for trains and it has been my experience that the trains in Italy run on time (thanks to dedicated train professionals, not any nostalgic Mussolini dictatorships). If bus schedules are fine-tuned to satisfy real needs and drivers are held to timely departures, there should be no risk of waiting interminably only to see two or more of the same bus number arrive simultaneously, a common occurrence in Rome today. Ban automobile advertising as has been done for other harmful products like cigarettes. Given the damage done by cars to our cities, our health, and most importantly our future, it is criminal to promote an image of automobiles as anything but the weapons of mass destruction that they are. Install bike racks in all public squares and condominium courtyards. This may seem like a very small project compared to the pedestrianizing of Rome, but bicycles are one of the miracles of modern society and could go a long way to solving our personal transportation needs if they were allowed to exist in Rome as they are in other cities. Other bike related solutions such as allowing bikes on public transit and creating bike lanes are also desirable but less urgent than simply providing bike parking. Bike sharing as it exists now in Rome has little more than symbolic value; in fact its strongest practical achievement is the freeing of a few square meters of urban space here and there (where the bikes are parked) from the eyesore of car parking. Decriminalize the installation of solar panels. At present the city of Rome has no clear policy regarding the installation of solar thermal and/or photovoltaic panels on buildings, or better the policy might be clear but the officials don’t understand it. The result is that attempts to incorporate renewable energy into building renovations have been met with accusations of illegal construction. The laws and economic incentives should be simplified, publicized and enforced to encourage well-designed and site-sensitive installation of solar (and wind and geothermal) technology in new and existing buildings. Result: Rome could reduce its fossil fuel consumption and related greenhouse gas emissions dramatically. Commission sustainability evaluations and upgrades of all government-owned properties: introduce energy conservation measures, insulation, renewable energy, space-use optimization projects. As capital of Italy Rome has a huge amount of state real-estate and often the worst track record in terms of energy consumption. By investing in improvements the government could fund research, help jump-start the green economy, and set a good example for private citizens. Hey, the Vatican has already done better, installing Italy’s largest PV array on the roof of Nervi’s auditorium. Set a target for 99% recycling of Rome’s trash by year’s end, providing reliable local solutions for composting organic waste, discarding without destroying reusable products, recycling paper, plastic, and metals in facilities managed and manned by local labor. My architecture students from Cal Poly last Fall were tasked with the design of a facility to collect, dismantle, process, recycle and reuse discarded electronics and other items; the results were not necessarily an optimal industrial system but in most cases a vibrant public space gravitating around something other than religious, political or corporate functions. Such places, nerve centers for the efficient use of material and human resources, could be inserted into the marginal spaces left over by the growth of the metropolis. 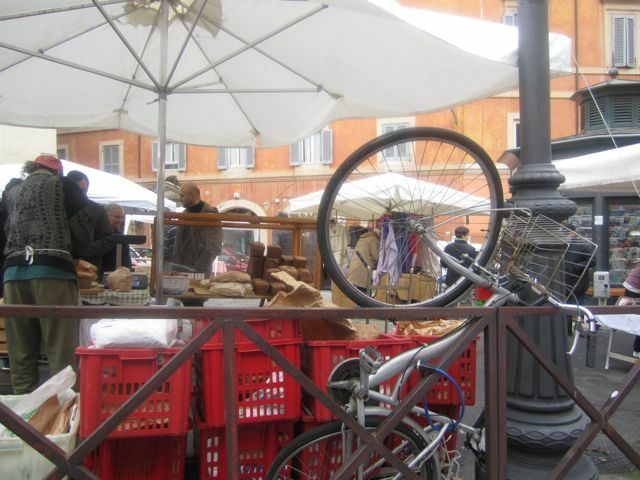 The notion of waste can be removed from Rome’s vocabulary. Result: greater employment, need for less new resources, reduction in pollution, more compelling public gathering spaces, elimination of waste transportation, more meaningful products. Rigorously enforce existing anti-littering laws, including pooper scooper requirements. Rome’s street cleaning force is amazing, but they fight a losing battle against a population of Romans and tourists (who justify their behavior with a defeatist “when in Rome, do as the Romans”) who drop trash wherever and whenever, leaving the city a depressing eyesore until the AMA crew comes along. Fight illegal billboards and other forms of graffiti as well. The city needs education, starting with school children, to instill the understanding that everything has its place and the place of a soda can is in a particular receptacle, not the ground. Redesign city surfaces and reintroduce green coverage to absorb and filter runoff water and prevent flooding and erosion. Rome’s problem is too much, not too little water. Conservation of water only makes sense in the context of a regional plan to send water to dry areas such as Puglia; in the short term Rome needs to prevent runoff water from increasingly dramatic storms from inundating the city and washing away soil and paving. The solution lies in grading, maintenance of the drainage system, and most importantly the design of permeable surface, either green or porous paving–Rome’s San Pietrini cobblestones are one of the city’s greatest contributions to humanity. Results: less water in the streets, more water in the ground, more resilient greenscapes. These ten resolutions are incomplete and just a start, but collectively the result of their implementation would be the Rome I like to dream of. 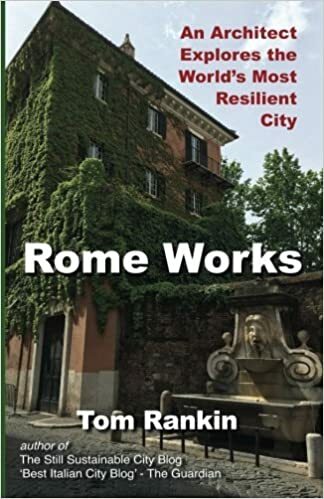 It is the Rome we have known for centuries, a richly layered palimpsest of cultural memory, actively evolving in the present and into the future but liberated from the damage of the petroleum economy. All sensible ideas. You use NYC as an example for a car-less city. In fact, a lot of NYC residents own a car, they just only use it for transport OUT of the city not through it. As a result, the idea of peripheral parking has been a live and well there for some time. The old piers were converted into parking garages decades ago and work well, in the same vein as you suggest using Rome’s under-utilized spaces for the same. One question, though, is how easily accessible are those cars. With NYC’s public transport it’s pretty easy for a resident of SOHO or Greenwich Village to zip over to pier 40, grab her car, and be off. How easy is it to get to Rome’s under-utilized spaces? The other issue is being able to temporarily access the city for picking up and dropping off. If one is using a car infrequently there are still times when we want to pull up in front of our building, park for a moment, unload, and move on. Year ago a Roman (maybe you?) told me that the simplest solution to Rome’s car problem was to enforce existing parking regulations. Visitors always ask why so many cars are parked on the sidewalks there; and any parent who’s tried to push a stroller through a typical Roman street can testify to what a frustrating experience that is. Thanks for the smart insider’s view. 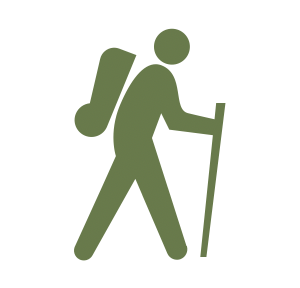 As is often the case, to restrict those who use the car irresponsibly those like you who want to use it responsibly, to carry children, elderly, suitcases etc for trips out of town, have to pay the price. ..(continue) i had to’ buy a new CAR! Have you seen a baby CAR seat on taxis in Rome? Nope! So you need your own CAR if you want your children to travel safe here..
Ps problem here is that we lack subways because of corrupted politicians and they Made a false Nike sharing just to’ look good.. The lack of subways is a problem (and the excuse of archaeology is not the only reason as you point out). But I believe a rational and reliable bus and surface rail system would fill the gap if we could only get the private automobiles off the city streets.